Welcome to the Hawk & Badger Railroad Photos section. Here you'll find a plethora of railroad related photos from several different contributors, all added with permission. This section is best viewed at a screen resolution of 1280 X 1024 or greater. A series of railroad photos I took on a trip to the Northeast US. The following was sent to me by a friend, Paul DeVerter. Here's a copy of the email that came with it. A couple of days ago, I received some photos of repainted NS engines in a modern Southern paint scheme, taken at Juniata shop, in Philadelphia. This is a facility owned by Bennett Levin, where he stores his private cars and does some repair work for others. In the just released issue of Trains Magazine is a photo of Prince Charles in Bennett Levin's cars. I spent the day with Bennett in Washington a week or two ago at the AAPRCO B/D meeting, and thereafter. The repainted engines are now out on the NS, and have been photographed by many people. I include one below. 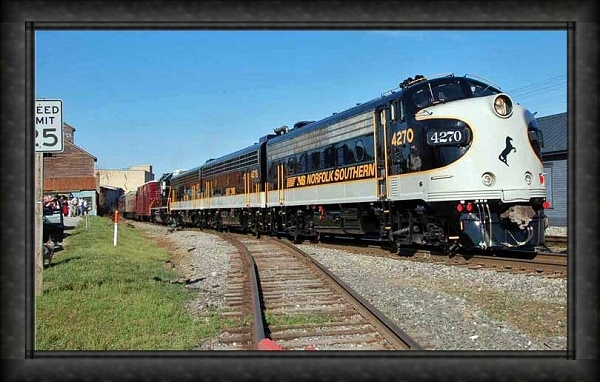 Simply Google Norfolk Southern Paint Schemes for others. Bennett said that the NS is very close to the Royals. I believe the NS is going to help the Queen celebrate the 400th year anniversary of the founding of Jamestown this Summer, and so my guess is that the NS will provide a business car train for the Queen and camp followers from Jamestown, or nearby, to the Kentucky Derby and then on to Washington, after the ceremony in Jamestown. So, in my opinion, the article in Trains, and the new paint job on NS engines all go together, and there will be a Royal train in the USA this May. Here's a press release from Buckingham Palace. The Queen, accompanied by The Duke of Edinburgh will pay a State Visit to the United States of America from 3 to 8 May 2007. Her Majesty will visit Virginia from 3 to 4 May, to commemorate the 400th anniversary of the Jamestown settlement. On 5 May, The Queen, accompanied by The Duke of Edinburgh, will attend the Kentucky Derby. From 6 to 8 May, The Queen and The Duke of Edinburgh will be in Washington D.C., for a visit hosted by President Bush and Mrs. Bush. This photo was sent to me by Christine Derksen, over in The Netherlands. A colleague of hers took it from their office window. Apparently it's the power for a steam excursion. 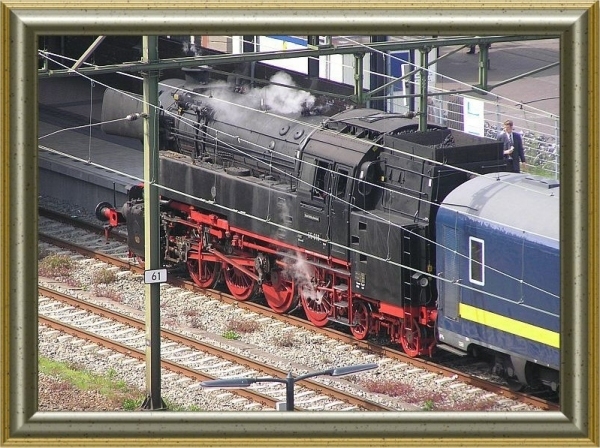 This is a German Locomotive - Series 65. Built between 1951 and 1955, this one is #18 of 18 manufactured, with a top speed of 85 kmh. The last of these were taken out of regular service from the German Federal Railway in 1972. This picture came from Steve Thompson, creator of the Sumpter Valley route for Microsoft Train Simulator. In my photo business, a local customer brought in a family album, wanting several images copied and restored. Along with really cool images of 1890's farming life and machinery, there are a number of real photo post cards. This one really caught my eye! It is a black and white real photo postcard, hand tinted, and quite sharp! A post on the narrow gauge forum brought this info! That's a photo of one of the engines on the Hemlock Central, Ephraim Shay's own logging railroad in Harbor Springs, Michigan. It was 30" gauge and the three engines were built in his machine shop, not by Lima. That is probably No. 1, named "Baby". I've never seen a color picture of this before! Also, the coal bunker appears to be located in the front of the passenger car. Later photos clearly show a more conventional coal bunker and water tank. The line ran from around 1897 until 1912, when it was dismantled. The photo came from the family album of Ken Dotson of Sumpter, OR.